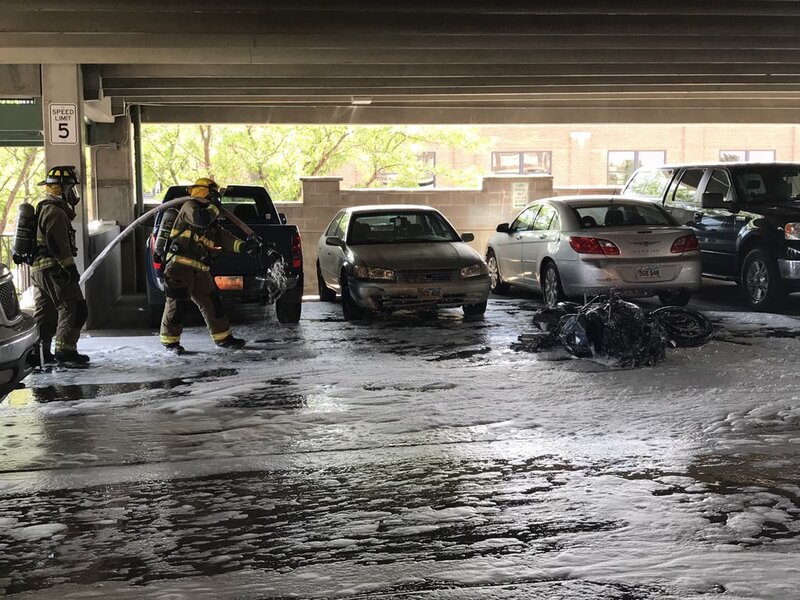 A motorcycle caught fire after it collided with a car at a parking garage Wednesday. RAPID CITY, S.D. - Rapid City Police and Rapid City Fire say a motorcycle collided with a parked vehicle and burst into flames Wednesday afternoon at Rapid City's Main Street Square parking garage. According to the fire department's Twitter feed, firefighters responded and ran a fire hose up to the second floor, where they were able to put out the fire before there was any damage done to the structure or other vehicles. Jim Bussell with the fire department says crews responded just before 3:!5 p.m.
"When we arrived on scene we had heavy black smoke coming from the second level of the parking ramp. What we had was a motorcycle that crashed into a vehicle and burst into flames. Truck one was able to get a line stretched really really quickly." Bussell added that the rider of the motorcycle was evaluated by paramedics at the scene and refused treatment and transport.